Published by Mountainblog on 07/06/2015 . lightweight, cool trousers that are just as suitable for mountain and coastal treks, and also longer treks such as El Camino de Santiago or other warm treks in the sun. Even in warm temperatures you often need long trousers to protect legs from scrub and biting insects out in the terrain. 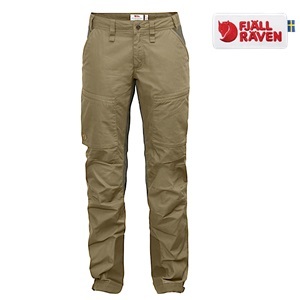 For this reason, Fjällräven has created lightweight, cool Abisko Lite Trekking Trousers. Their design is similar in many ways to the popular Keb Trousers, but the Abisko model uses materials selected for maximum functionality in warm conditions. Abisko Lite Trekking Trousers are made from durable four-way stretch fabric and Fjällräven’s lightweight, strong outdoor fabric G-1000 Lite, which makes for a pliant, fast-drying garment with excellent ventilation. Long ventilation zippers from the hips to the knees release excess heat on extra warm days. strides. There are two hand pockets as well as spacious leg pockets with zippers for a map or the like. The leg endings have strap adjustments and boothooks that prevent them from riding up. Reinforcements at the leg endings and on the inside of the calves make them extra resistant to wear. The trousers are available in men’s and women’s models and will be available in stores from spring 2016. Sizes: Men 44-60, Women XXS-XL Materials: G-1000 Lite: 65% polyester, 35% cotton.